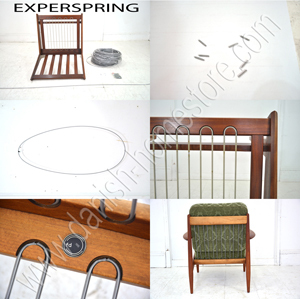 Clear vinyl covered loopspring / Experspring for replacement in most midcentury Danish chairs and seats. With central core of steel coil spring. For use in most midcentury and Danish chairs & settees. £5 pr meter. The spring is supplied in one long coil which you need to cut into the required length. You simply order the total amount of meters you need. Screw into one end the connector thread supplied and counter twist the other end 5-6 times before joining the ends and twisting them together. The counter twisting first stops the spring from coiling up when you join the ends! Price is pr meter including connection screw thread. Postage charges apply and are calculated automatically by the system based on the meters you order.